"The #1 New York Times bestselling author of It Ends with Us—whose writing is “emotionally wrenching and utterly original” (Sara Shepard, New York Times bestselling author of the Pretty Little Liars series)—delivers a tour de force novel about a troubled marriage and the one old forgotten promise that might be able to save it. All Your Perfects is a profound novel about a damaged couple struggling with a relatable issue – infertility – whose potential future hinges on promises made in the past. 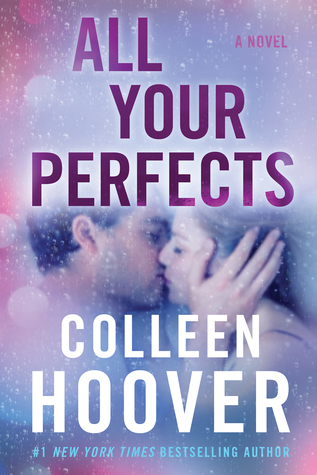 In Colleen Hoover’s inimitable style and brilliant narrative voice, this heartbreaking page-turner asks: Can a resounding love with a fairytale beginning survive a lifetime between two imperfect people?" This book packs a punch. Colleen Hoover books are always emotional but this one was super heavy at times. It is not easy to read about the struggles these two are facing, and that is exacerbated by getting to experience how happy and adorable they were once upon a time. Quinn and Graham both broke my heart, but both also made me so mad at times for various reasons. Honestly there were moments where I did not like either one of them. But herein lies the beauty of a CoHo book, that never mattered to me, because their flaws make them real and at the end of it all I wanted them to make it so so SO badly. These characters feel so real and it really makes you invested in their story. I also really enjoyed the way this story was told. Flipping between the then and the now made the story super addicting and helped to cure the heartache. It was nice going back to the then moments when the now got to be a bit too heavy to deal with. I admit I enjoyed the then moments a bit more, but I think that's to be expected. Again though, the happy then moments did make the now hurt much more because you know it wasn't always like this. Which brings me to my next point... communication people! You have to talk about your issues or they never get solved... you can't bottle these things up. Colleen Hoover delivered once again with All Your Perfects. She knows how to write a book that will hit you right in the feels.